Yesterday I bought a wonderful tote in a bookstore. It was covered with images of vintage cameras and I mentioned to my wife I had probably shot with half of them. She said that was really fun, and challenged me to find the rest and photograph with them so I would have used every camera on the bag. Now who could resist a challenge like that? Did I mention I’m married to the most wonderful woman in the world? The bag has 18 cameras and I’ve identified all but one. Three of them are Polaroids for sure – and the one pictured above is the mystery camera I think/thought was a Polaroid as well. But for the life of me I can’t find an image anywhere on the web that seems to match up. Do any of you have an idea if it is indeed a Polaroid or if I’m misreading the form factor. Thanks a ton for any feedback. Thanks xya. I can't believe how inexpensive this camera is on that big auction site. Can't wait to get one and take it out for a spin. Anything in particular I should be wary of in a used one? Thanks 3rd, I've been researching the camera since xya told me what I was seeing. Now I've read a lot about the problem with old film for these cameras, but found some with an expiration date of 1981. Probably not much will come from it, but for the project I have to give it a go! you won't have any results - unless you are really lucky - with an expired roll film from 1981.
the only way to shot with this camera is to replace the back with a pack 100 back. 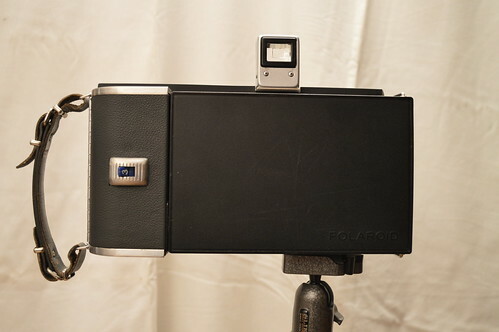 I've looked at a couple of packfilm conversions ulf, it seems pretty complicated. Did you do that one? It looks really clean. yes, I did that one, it is not that complicated actually... just takes some time (especially to change the "leather" - which is absolutely not necessary of course).